Nucle­ar Taco Sen­sor Hel­met Gameshow is the name of our pro­ject entry for the 48h hack pro­ject of Sapo Code­bits 2011. The aim of the com­pe­ti­ti­on was to deve­lop a pro­ject during 48 hours and pre­sent it in 90 seconds to a live audi­en­ce. Out of over 80 pro­po­sed pro­jects, 65 were pre­sen­ted live. We won the 1st pla­ce of the public voting. The 48h pro­ject con­sis­ted of buil­ding a hel­met devi­ce with humi­dity, tem­pe­ra­tu­re and fluid inta­ke sen­sors, used to record and mea­su­re the reac­ti­on of nucle­ar taco vic­tims of Code­bits 2011 Nucle­ar Taco Chal­len­ge. The sen­sors and ser­vos are con­nec­ted by Ardui­no. 6 time­lap­se vide­os were recor­ded docu­men­ting the user expe­ri­en­ce. 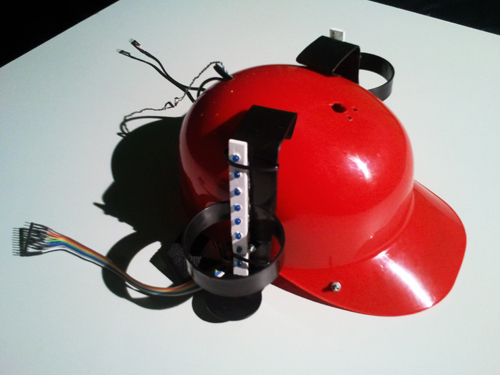 The 1:30 pro­ject pre­sen­ta­ti­on was in the sty­le of a Japa­ne­se gameshow using Open­Fra­meworks. The host dis­played using face subs­ti­tui­on tech­no­logy in real­ti­me. Do something fun with sen­sors and Ardui­no, that would show peo­ple how easy it is to use the­se things. 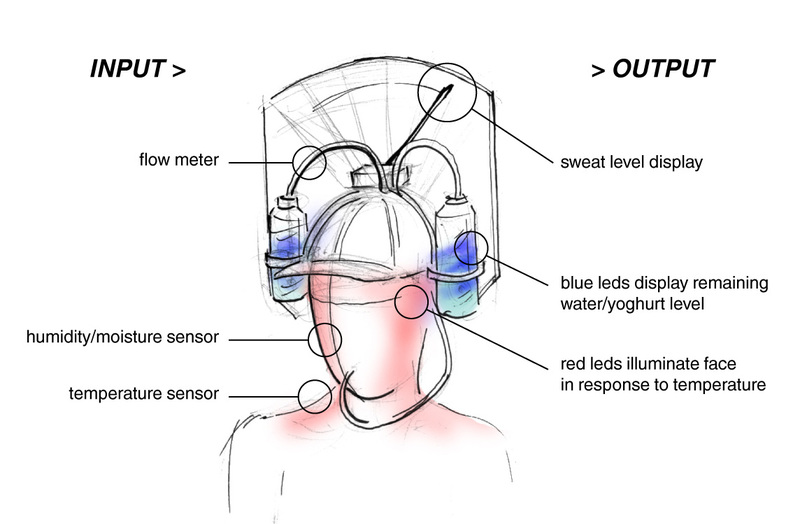 Show­ca­se appli­ca­ti­ons of recent Face Trac­king and Face Subs­ti­tu­ti­on tech­no­logy. Do a pre­sen­ta­ti­on for­mat that would not lea­ve anyo­ne indif­fe­rent to our pro­ject. Bring atten­ti­on to the cre­a­ti­ve com­mu­nity we have in the Audi­ên­cia Zero hac­ker spa­ces in Por­tu­gal (LCD in Por­to / Gui­ma­rães, xDA in Coim­bra, altLab in Lis­bon), in hopes of get­ting new mem­bers. Take home some new hard­ware. 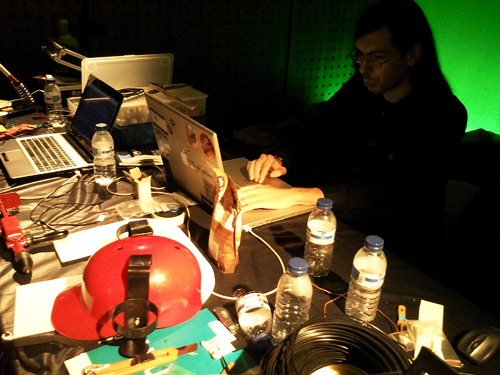 Nucle­ar Tacos Sen­sor Hel­met Gameshow @Codebits 2011 from altlab Lisbon’s Hac­kers­pa­ce on Vimeo. At Sapo Code­bits 2010 the event orga­ni­zers held a nucle­ar taco chal­len­ge during one of the nights of the event. Many bra­ve atten­de­es spent their last day of the event in seve­re dis­com­fort, cur­sing their ide­a­li­zed bra­very. No mem­bers of our team were bra­ve enough to take on the nucle­ar taco chal­len­ge but the memo­ri­es of everyo­ne else suf­fe­ring lin­ge­red on with us. Then one day a light­bulb was tur­ned on insi­de Mau­ri­cio Mar­tins’s head when he saw a tv comer­ci­al for MEO fea­tu­ring Ricar­do Arau­jo and an “all Ame­ri­can” beer hel­met. The idea Mau­ri­cio had awa­ken insi­de his head was to use his Ardui­no and sen­sors exper­ti­se to pimp that beer hel­met into a nucle­ar taco sen­sor devi­ce of some sort. He began loo­king for the pie­ces requi­red. By the way, if you want to learn how to use Ardui­nos for ran­dom pro­jects, the­re are some workshops at altLab on a regu­lar basis. The hel­met itself was qui­te hard to find for sale in Por­tu­gal. After many sear­ches on the inter­net, we ended up buying it at epia.com for 10 euros. The Ardui­no, LEDs, tem­pe­ra­tu­re and humi­dity sen­sor were easily acqui­red anywhe­re onli­ne. The flow mea­su­re­ment sen­sor was alot har­der to find, we ended up buying it second hand from ebay. The web­cam for the head moun­ted view used was a Micro­soft Life­Cam VX-2000 bought by 20 euros. Ove­rall the hard­ware cost was around 60 euros. Whi­le Mau­ri­cio was sear­ching for the hel­met he recrui­ted two new mem­bers for our team. To assist with the hard­ware the Luso — New Zea­lan­dinsh Tia­go Ror­ke, a semi-regu­lar altLab atten­der. And to han­dle the pre­sen­ta­ti­on for­mat, the Por­tu­gue­se demos­ce­ner emi­gra­ted in Hel­sin­ki, Fin­land Fili­pe Cruz, who had alre­ady col­la­bo­ra­ted with Mau­ri­cio on a Code­bits pro­ject in 2010 (the Blind Pong pro­ject). A cou­ple of weeks befo­re the event, Mau­ri­cio and Tia­go Ror­ke got together to wri­te a first abs­tract des­crip­ti­on of the pro­ject, do some sket­ches of the ide­a­li­zed hel­met and sent the text to Fili­pe. Few days later the three of them had a sky­pe call to defi­ne the pre­sen­ta­ti­on for­mat and hear Fili­pe explain his con­cept idea of having a japa­ne­se gameshow sty­le of pre­sen­ting the pro­ject to the public. A cou­ple days befo­re the event the three mem­bers of the team finally mana­ged to get together phy­si­cally to dis­cuss the pro­ject in per­son. Taking the opor­tu­nity to test some com­po­nents (the sen­sors, the Face­Trac­king library by Artu­ro Cas­tro, Kyle McDo­nald and Jason Sara­gih) and more impor­tan­tly: to deci­de on a final name for the pro­ject. Nucle­ar Taco Sen­sor Hel­met Gameshow was the deci­si­on. Mau­ri­cio and Tia­go Ror­ke spent the day wor­king on the hel­met, mos­tly buil­ding and tes­ting the sen­sors with the Ardui­no and deci­ding on how they would be pla­ced on the hel­met. 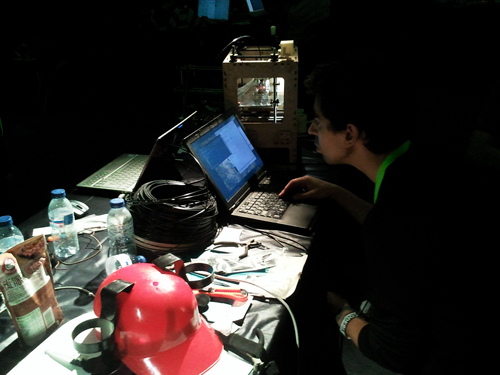 Fer­di­nand Mei­er, a resi­dent mem­ber of altLab was recrui­ted to help prin­ting small pie­ces for the hel­met with the Maker­bot. Fili­pe arri­ved late and star­ted wor­king ime­di­a­tly on the fra­mework for the pre­sen­ta­ti­on usingOpen­Fra­meworks, mos­tly tes­ting back­ground effects in a Japa­ne­se swish swash sty­le and trying to clo­se the pre­sen­ta­ti­on story­bo­ard. Fer­di­nand who was alre­ady a new mem­ber of the pro­ject at this point offe­red his Blen­der skills to cre­a­te a model of the hel­met in 3D to be used in the pre­sen­ta­ti­on. Whi­le the hard­ware guys were strug­gling with the sen­sors, Fili­pe was tes­ting ofx3DModelLoader with Ferdinand’s 3D model exports of the hel­met. Seve­ral 2D ren­ders of Japa­ne­se vir­tu­al idol Hat­su­ne Miku model­ling our hel­met were also taken. The open sour­ce 3D model of Miku was taken from blen­der­na­ti­on. We had to rush this pro­cess sin­ce Ferd had to lea­ve the Code­bits event that night to attend a con­fe­ren­ce in Por­to. We did not attend the Ele­va­tor Pit­ch talk. Tia­go Far­to was recrui­ted to help with the graphic effects of the pre­sen­ta­ti­on. The back­ground effects you see are all run­ning on pixelsha­ders real­ti­me under open­fra­meworks. It was not tri­vi­al to get the sha­ders setU­ni­form to han­dle tex­tu­res pro­perly under open­Fra­meworks. We spent qui­te a few hours debug­ging and wild gues­sing their fra­mework sin­ce neither Fili­pe nor Tia­go had expe­ri­en­ce run­ning sha­ders on open­Fra­meworks. 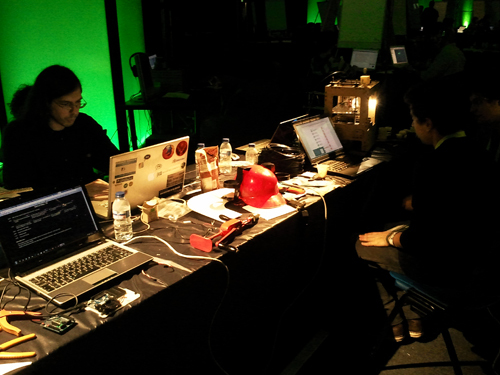 During the night we were one of the few teams still left hard at work at the party­pla­ce at 3 am. Mau­ri­cio and Tia­go Ror­ke finishing the hel­met — tes­ting the liquid flow sen­sor, buil­ding the ser­vos, gluing the led struc­tu­res, pain­ting the hel­met. We didn’t mana­ge to sle­ep much on the first night of the event, some of us were fal­ling asle­ep on our com­pu­ters whi­le still trying to get some work done. 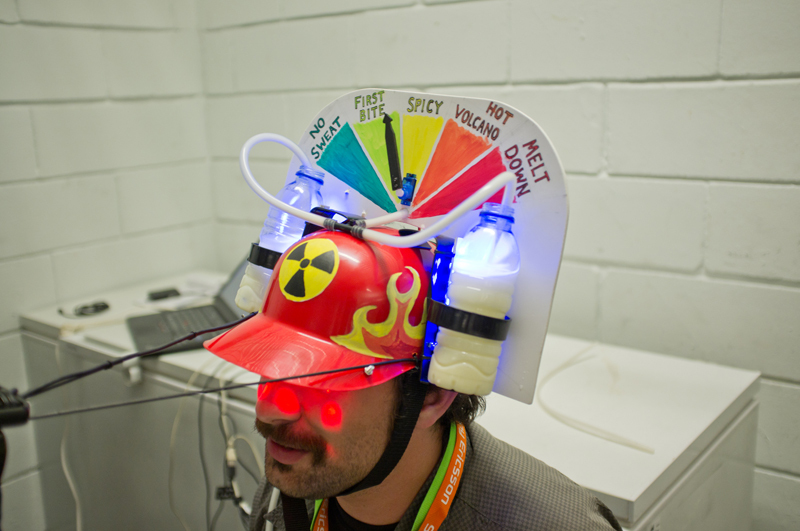 We star­ted having to turn down folks who were coming to ask us to print ran­dom things on the maker­bot. We sadly had to do this becau­se we were so busy finishing the pro­ject for the com­pe­ti­ti­on. The hel­met nee­ded to be finished and ready for the code­bits nucle­ar taco chal­len­ge whi­ch was hap­pe­ning at 19:00. Mau­ri­cio and Tia­go finished the hel­met, atta­ched the head came­ra and went to the Taco Chal­len­ge area to record some foo­ta­ge. Tia­go wor­ked on the title scre­en fla­mes effect whi­le Fili­pe re-struc­tu­red the fra­mework and tes­ted the video play­back right befo­re having to head out to give his spe­a­ker talk “Crash cour­se on Pho­ne­gap + Sen­cha Tou­ch”. Mau­ri­cio and both Tia­gos went to the taco loun­ge and mana­ged to record foo­ta­ge from 6 volun­te­ers wea­ring our hel­met whi­le eating their nucle­ar tacos. Big thanks to Pedro Umbe­li­no, Dani­el Frei­tas, Pedro Sil­va, Tomé Duar­te, Joa­na Fer­rei­ra and Artur Gou­lão for their assis­tan­ce! We ended up only using 4 of the 6 vide­os. Meanwhi­le, back at the altLab table Fili­pe had ended his spe­a­ker talk and was back to work on the pre­sen­ta­ti­on code with some inter­rup­ti­ons to try and find out whe­re the con­fes­si­o­nary room whe­re we were sup­po­sed to pre­sent our pro­ject 1 hour ago was loca­ted. He fai­led. Noti­fi­ed Mau­ri­cio and deci­ded to attend the spe­a­kers din­ner ins­te­ad. Upon return, Fili­pe mana­ged to find whe­re the con­fes­si­o­nary room was loca­ted whi­le the rest of the pro­ject folks atten­ded the Scor­pi­ons con­cert. We finally mana­ged to get sky­pe inter­vi­ewed by chew­bac­ca and darth vader. It went rather well and we were hope­ful that our pro­ject would get selec­ted for the group A of pro­jects pre­sen­ting live on sta­ge. The rest of the night was spent edi­ting video and fin­ding the per­fect Japa­ne­se face to use on the Face­Trac­king part of the pre­sen­ta­ti­on. Shi­do Naka­mu­ra was the final selec­ti­on. Fili­pe had some night­ma­res about for­get­ting what to say live on sta­ge and screwing up the Japa­ne­se accent. Tia­go Ror­ke ended up wor­king another all nigh­ter doing some video edi­ting and drawing a 2d taco for the pre­sen­ta­ti­on. By the way, the music we used for the final part is ParagonX9 — Cha­oz Air­flow, avai­la­ble under a Cre­a­ti­ve Com­mons by-nc-sa licen­se. And the short clip of Japa­ne­se crowd che­e­ring was snip­ped from a ran­dom you­tu­be video of a ran­dom Japa­ne­se gameshow whi­ch we can’t find any­mo­re. We all woke up later then plan­ned and fee­ling somewhat sick and tired of wor­king on the pro­ject. But one final effort was still nee­ded, the pre­sen­ta­ti­on had to be per­fect! We did a few ite­ra­ti­ons of the final chal­len­ge video, adding sound effects and tes­ting the length. The story­bo­ard still suf­fe­red a few small chan­ges to cre­a­te big­ger cres­cen­do impact. Last minu­te over­lay graphics of the sen­sors were desig­ned by Tia­go Far­to and quic­kly inser­ted. Test on the sta­ge pro­ved the face­trac­king could work without addi­ti­o­nal ligh­ting. Everything see­med more or less ready. Just one more ren­der of the final video with some more small impor­tant chan­ges requi­red. Pre­sen­ta­ti­on had some glit­ches but went rather well. The crowd mana­ged to get into it and that was reflec­ted hea­vily on the voting. Gre­at posi­ti­ve reac­ti­ons both in per­son and through the twit­ter feed. We were very ple­a­sed and loo­king forward to the pri­ze giving. Tia­go Far­to had to lea­ve early and Ferd never mana­ged to come back to Code­bits sin­ce Thurs­day, so we were left only 3 of us, Mau­ri­cio Mar­tins, Fili­pe Cruz and Tia­go Ror­ke to col­lect the pri­zes! We won the 1st pla­ce public award and offe­red the sen­sor hel­met devi­ce to the Code­bits orga­ni­zers infor­ming them that all the peo­ple invol­ved with orga­ni­zing the Nucle­ar Taco Chal­len­ge had to take pic­tu­res of them­selfs wea­ring the hel­met and uplo­ad them to the inter­net. Domo Ari­ga­to to everyo­ne for your feed­back and sup­port. We are very happy you liked our pro­ject. Ple­a­se come and join altLab or another Audi­en­cia Zero hac­klab clo­ser to you. We need more peo­ple sha­ring kno­wled­ge and doing things with tech­no­logy. If you liked our pro­ject, ple­a­se flat­tr it to sup­port our hac­ker spa­ce labs.